David Chozick - Dworkin, Chambers, Williams, York, Benson & Evans, P.C. 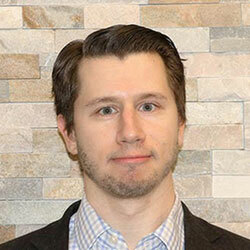 Mr. Chozick is originally from Dallas, Texas and received his B.S. from Indiana University in 2011. He received his J.D. from Thomas Jefferson School of Law in 2014. Prior to joining the firm, he was General Counsel for a debt collection agency where he dealt with a variety of issues including consumer credit and employment. Mr. Chozick’s practice currently focuses on workers’ compensation. Mr. Chozick is licensed in Colorado and is a member of the Colorado Bar Association and Denver Bar Association.